OK guys, it is all going live today. You are getting it here first. The teaser sight has flipped to a full microsite with all of the details on each model. Below is the press release that will go out later today and a few photos of the line. 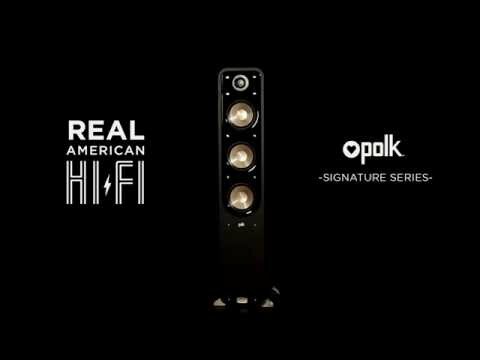 DALLAS (Sept. 15, 2016)—Today at CEDIA 2016, taking place in Dallas Texas from September 15-17, Polk Audio, an award-winning high-performance audio brand with more than 40 years of sound engineering and design expertise, announced the launch of its latest loudspeakers, the Signature Series—a collection of floor standing tower, center and bookshelf speakers that incorporate premium audio technologies drawn from Polk’s top-of-the-line home entertainment speakers, including the Monitor, RTiA and LSiM series at an industry-leading price. As the first Polk Audio line to receive Hi-Res certification, coupled with Polk’s exclusive Power Port® technology and a reimagined design for the modern home, the Signature series provides the ultimate movie and listening experience. The new collection consists of the S60, S55 and S50 floor standing tower speakers; the S35 and S30 center channel speakers; and the S20, S15 and S10 bookshelf surround speakers. Available in a handsome blackwash walnut, the Signature Series’ modernized design incorporates beautiful curves and gilded accents for a bold and stylish look, fitting for any room in the home. The full-size towers, bookshelf speakers and a powerful, traditional and slim center speakers create a completely immersive home theater experience, delivering balanced and precise sound for movies and music. The Signature Series feature Polk’s patented Dynamic Balance Technology Driver Design, which analyzes each speaker’s entire electro-acoustic and mechanical system, enabling Polk engineers to integrate the best materials and most efficient geometry while eliminating issues that reduce speaker performance, resulting in drivers and tweeters that offer extremely precise sound. Additionally, Polk integrated its famous Power Port technology, which extends the overall bass port and providing greater surface area to eliminate turbulence and distortion for a bigger, more musical deep bass impact. Integrating all that users love about classic Polk Audio component systems, the flagship Polk Signature S60 tower speaker boasts a range of features to deliver the best sounding audio reproduction available at its price point. The Hi-Res certified towers feature 1 inch Terylene tweeters that are capable of delivering 40 kHz to support the latest high resolution files. Additionally, curvilinear formers and an advanced ceramic motor structure extend low frequency response and reduce overall resonance for better dispersion in the midrange, producing amazingly clear vocals and instruments. Three 6.5 inch custom mica-reinforced polypropylene cones with butyl rubber surrounds, massive ceramic motor structures and high-temperature Conex fiber spiders all combine for high efficiency, producing clean bass, better linearity, lower distortion, and greater durability. The Signature Series tower speakers all feature Polk’s patented Power Port design, which smoothly transitions air flow from the speaker’s port into a listening area. It also extends the bass port, providing greater surface area to eliminate turbulence and distortion, which results in a bigger, more musical deep bass impact. 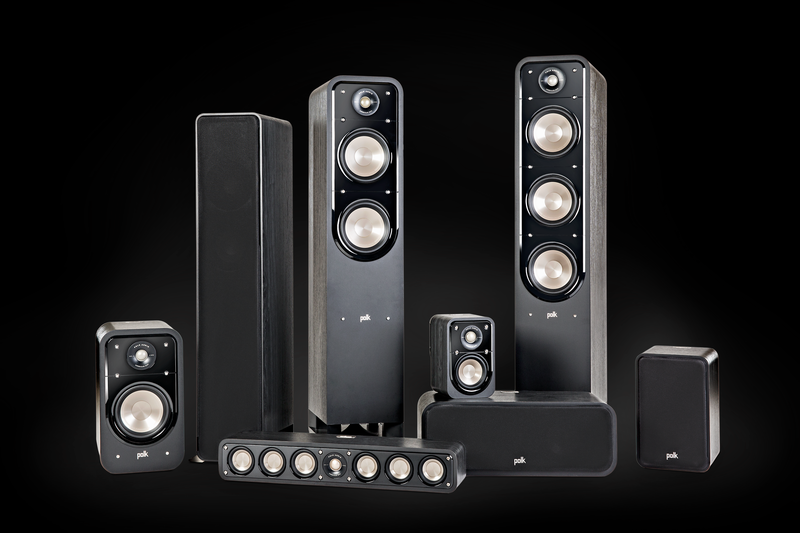 Rounding out the Signature Series tower speaker options, the S55 and S50 offer the same incredible performance as the S60 tower speaker, with the S55 featuring two 6.5 inch mid-range drivers and the S50 featuring two 5.25 inch drivers. The Signature Series performs well with even the most modestly powered amplifier or receiver, whether users are looking to connect them with the latest digital processor or their vintage rig, the sound reproduction will be spacious, clear and realistic. Other features include a four-driver (S60 and S55) and three-driver (S50) cascading tapered crossover array for a more life-like sound stage; anti-diffraction grills for a perfect fit and minimized sonic interference; and dual gold plated five-way binding posts for easy set up. The handsome cabinet is strong, rigid and acoustically inert with non-resonant all-MDF construction, timbre-matched materials for seamless speaker-to-speaker blending. Supporting the latest in home theater setups, Polk’s center channel speakers, the S35 and S30, are designed to be an unobtrusive way to bring clean, full-range sound for movies and music. With a slim form, the S35 stands at a mere 4 inches tall, making it the perfect addition underneath the most slender televisions. Both the S35 and S30 feature one 1 inch Hi-Res Terylene tweeter for crisp, clear high frequencies and mica-reinforced polypropylene cones, ranging from six 3 inch cones (S35) and two 5.25 inch cones (S30). Dual Power Port technology delivers extended deep bass, and 3dB more bass response output than a traditional port. Similar to the tower speakers, the S35 and S30 center channels are highly sensitive and power efficient, working efficiently with most receivers. The S35 features a six-driver array while the S30 offers a two-driver array, while each featuring, anti-diffraction magnetic grills and gold plated five-way binding posts. Additionally, the S35 can be used as a left, center or right speaker (L/C/R) and can be wall-mounted horizontally or vertically with built-in keyhole slots. Designed to bring every detail to life, Polk Signature Series bookshelf speakers, including the S20 and S15 elevated sound for movies, TV and music in a handsome cabinet. An ideal front or rear speaker for any 5.1, 7.1 or 9.1 home theater configurations, the compact bookshelf speakers feature a single 1 inch Terylene tweeter. Each speaker also hosts a single low distortion mica-reinforced polypropylene cone, ranging from 6.5 inches (S20) to 5.25 inches (S15). 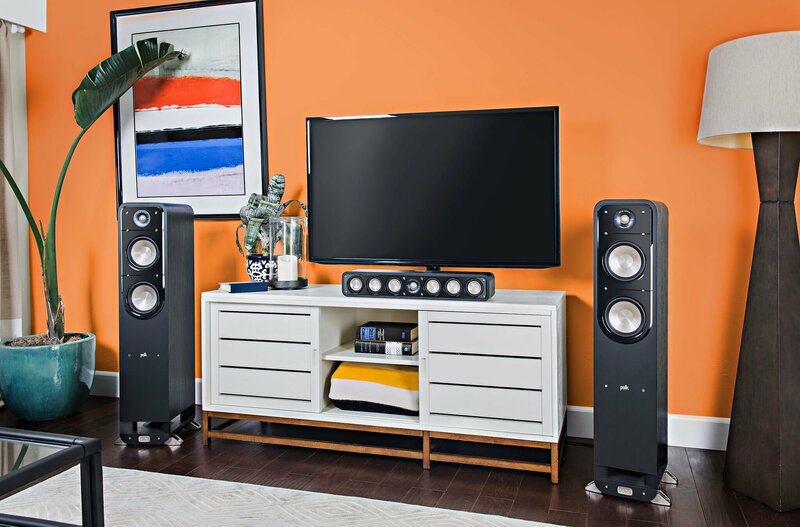 With Power Port for authentic bass impact, precise blending of the driver and tweeter combination and two-way cross over array for a massive sound stage, and easy wall-mounting, the Signature Series bookshelf speakers can be used as standalone monitors or as the ideal complement to a powerful home theater system. 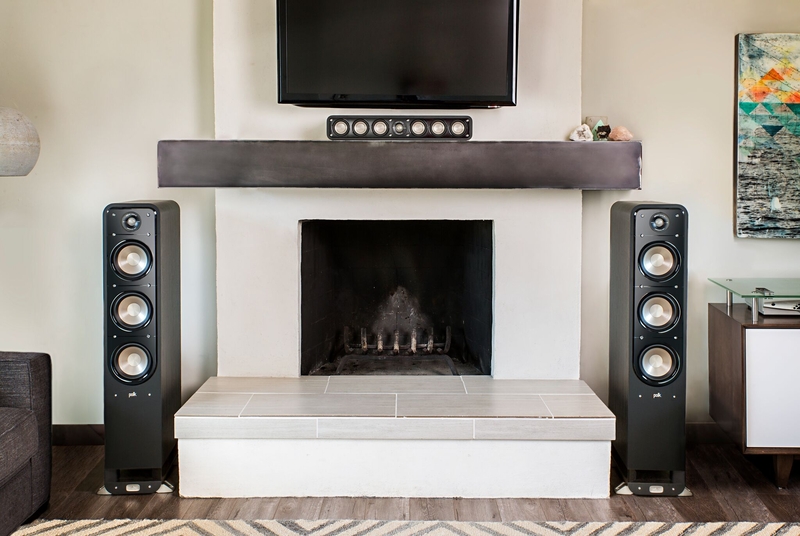 Designed to bring every detail to life, Polk Signature Series S10 surround speakers add dimension and perfectly complement any multi-channel home theater configuration. The compact satellite surround speakers feature a single 1 inch Terylene tweeter and a single low distortion mica-reinforced 4 inch polypropylene cone. 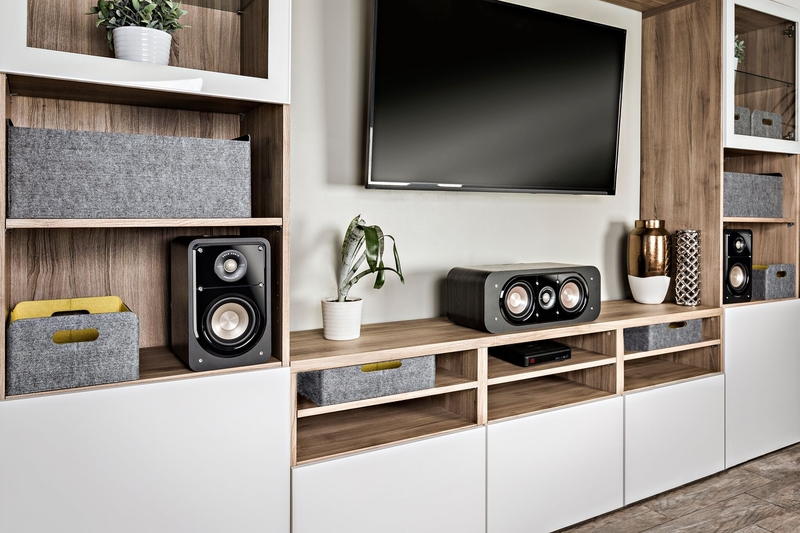 The S10 surround speakers feature Power Port for increased bass response, a two-way cross over and are timbre-matched to the Signature floor standing and bookshelf speakers. Wall mounting can be easily accomplished leverage the built-in threaded insert or keyhole slots. The Signature Series will be available for purchase at PolkAudio.com as well as ABT, Amazon, BestBuy, Crutchfield, Nebraska Furniture Mart, and other national retailers. 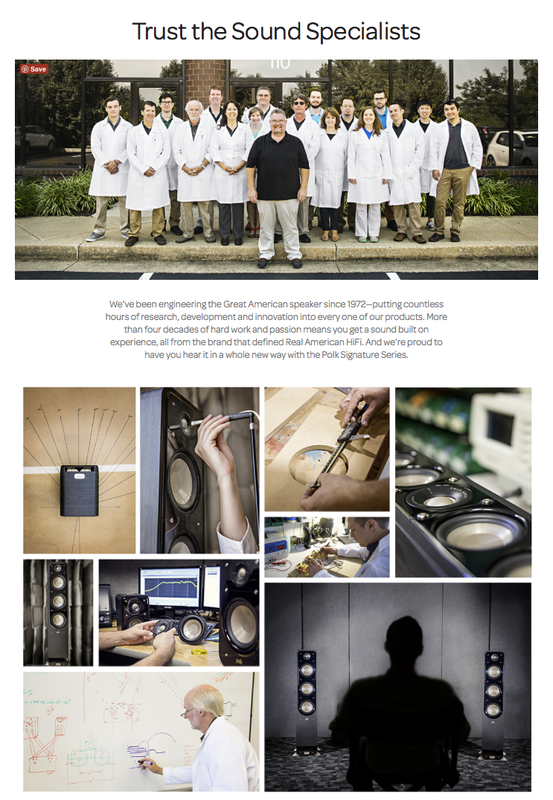 For more information on Polk’s collection of high-performance audio products, please visit PolkAudio.com. To view the Signature Series at CEDIA, attendees may visit Arts District 2, adjacent to the Omni Hotel. Consumers’ can experience the Signature Series at the Dallas Nebraska Furniture Mart location. This is all great and interesting but how do they sound. From your experience compared to say rti series and lsi? is the sound not as bright as rti? I guess we're just going to have to go listen to them ourselves... Pricing alone says they are not up to par with the LSi / LSiM series... but I could be wrong. True, best bet is going to listen to them ourselves but considering the locations which will sell them, they are by far not optimal places to conduct a good demo. Something about the base looks a little discongruent with the rest of the tower design. Speaking in terms of the current housing and "millennial" market down here in the south, IMHO, I think Polk did a pretty good job for the price range. 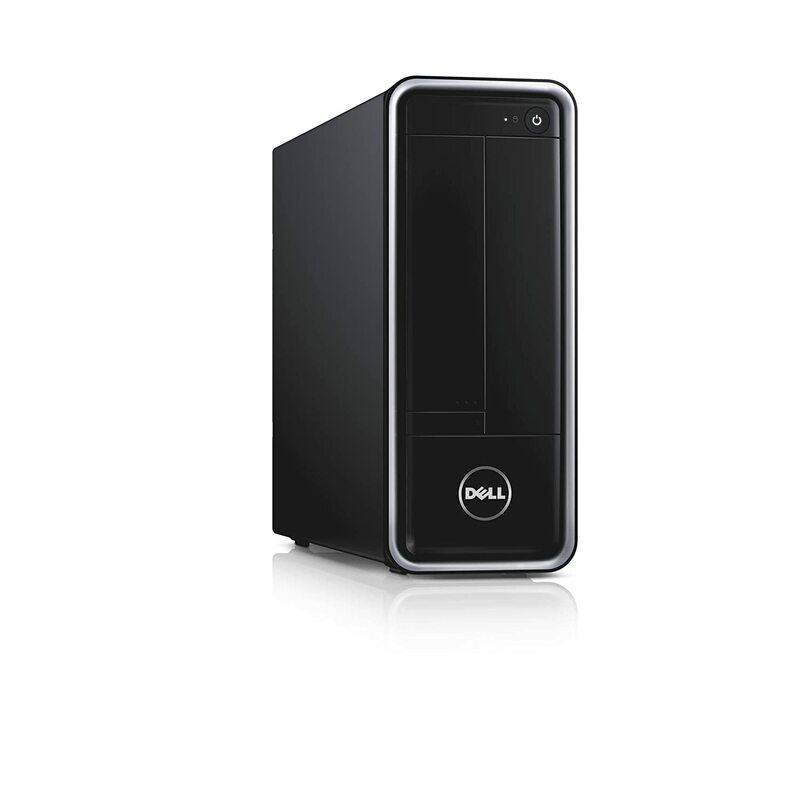 The power port placement and design *appears* to be designed for relatively easy placement placement. A birdie told me (pics provided on other thread) they actually sound pretty good, and he has a similar ear for sound as I, that I trust. In laymen's terms, is discongruent the same as discombobulated? As a millennial who these are marketed towards, these would LOOK fantastic in my 1 bedroom's living room. Much more modern than my older RTi's. However, as you guys mentioned it's all about sound and price. Tough to turn down better sounding speakers when you can get them at the right price. Computer nerd diving head first into quality audio. man those look sweet hope there are as heavy hitters as they appear. If Polk would slip me a CEDIA ticket, I could give you first hand impressions, hint, hint. Get over to Nebraska furniture in Dallas and look for Russman. I like the looks but can't hear them until October right? Grabbing some of those fun looking bookies when I can. Ugh, all the wait and hype for this? Personally I dislike the new look. There's nothing fresh or even retro about this design. It's as if they're appealing to the quasi-hipster. It's got the same feeling as when they changed over to this new forum format to appeal to the iPad centric user. I hope they sound significantly better than they look. The design reminds me of the SONOS SUB. Would I buy one? Sure. But I'd hide it behind the couch. Hard to place these? Are they RTi-A upgrades or another mod of the Monitor/TSi series as their pricing is much "lower" than RTi-As? The appearance is mostly in line with any number of speaker makers who have taken to the piano black plastic front? Is that some kind of millennial trend? The most important thing, as noted above, is how they sound. They are all crossed over at 2.5Khz (the same as the TSI series?). I favor a lower crossover point for music but 1800-3000hz is in the acceptable range so we need to hear some! What I am most curious about, again noted above, is the TWEETER. The tweeters on the old TSIs and the Rti-As were different in that the TSI had a little less resolution and handling power but sounded less bright. And the Rti-As could take it all day but were too bright and yet not necessarily the BEST resolving tweeter, they merely seemed so. So this Terelyne, I defer to our resident biochemist here, seems to be a some slightly better poly-textile dome than what we've seen before. The material itself is WIDELY available and has been used in many venues outside of audio. Citing its name gives it an aura of technical legitimacy, lol We need to hear the Terelyne and, more so, its integration with the other drivers in the system. So, looks: OK to good depending on your "age"! Innovation: Jury is out. Power port tech is not NEW. 2.5hz crossover point has been widely used by Polk, crossovers-we can't see those. Cabinet sizes are reminiscent of Monitor and RTIs. Weight, a tad more than M-70s but much lighter than Rti-A9s? And so on! Oh, I almost forgot about the Mica reinforced polypropylene woofers-yeah, those have been around for a while too in different iterations with differing results. Here's hoping the sound is better! This is what the tower looks like with the grille on. Ideas on mounting the S10's so I can dial them in as heights? I applaud Polk's R&D team's efforts to innovate and develop. Its easy to lose sight of the constraints and difficulty of the job they must have, for a variety of reasons we are often unable (or unwilling) to appreciate. I bet these babies punch way above their price point. Congrats and looking forward to not only hearing these but also to more products soon. Keep up the good work! And no, I was not just blowing sugar up your behind so the demos would start near me. Lol. I bet these babies punch way above their price point. Russman stated "I wouldn't consider these entry level speakers"...."They perform way above the price"...."prefer the sound over the RtiA"
Russman has ears I trust as well. Between his approval of this series and what I heard with the T-50, it looks like Polk has the right engineers on the job to pull Polk back into the limelight. I'm excited to be a dealer for them and hope this is a line I can really sell. Well let the demos begin. How do you think these will stand up to the UniFi line? Congrats on the new line! I personally think they look clean and sleek. Some of you guys seem to want Polk to reinvent the wheel. I like the look of the skinny center channel. Of course the big question is how do they sound. I'm sure they are fine for movies, but how are they with music? If that tweeter is too sharp, then it would probably be a bust for music. It seems to be a delicate balance to get the right tweeter for both music and movies, and for me that is a must since I will only ever have one system for both. Can't wait to read reviews as they come out. DSkip, are you going to be checking these out? Take closer pictures, especially around the edges where the teasers looked plasticky.